Rep. Ilhan Omar is doubling down: Jews, she suggests – not just the American Israel Public Affairs Committee (AIPAC), a pro-Israel lobby group — use money to bribe Congress to defend Israel, which it would not otherwise do. That is the none-too-subtle claim she made Sunday evening in a series of tweets and retweets that has ignited a furore over antisemitism in the Democratic party. Omar began by responding to Glenn Greenwald, a widely-known critic of Israel who lamented that members of Congress defended Israel. She tweeted, “It’s all about the Benjamins baby,” suggesting the influence of money. Omar — who tweeted in 2012 that “Israel has hypnotized the world” — is wrong. Worse, she is evoking ugly anti-Jewish stereotypes, prompting criticism from Jewish leaders and even from some fellow Democrats. The reason Congress is generally supportive toward Israel is simple: Americans support Israel. A Gallup poll last March suggested Americans prefer Israel over the Palestinians by nearly a two-to-one margin. Anti-Israel and antisemitic conspiracy theorists try to explain that by claiming Jews control the media. But that is not true, either: media coverage today is often critical of Israel. There are five reasons Americans like Israel. One is the same reason predominantly Christian nations around the world admire Israel: the Bible identifies Israel as the land of the Jewish people. Americans, as a more devout nation than most in the western world, tend to feel that connection more strongly. America’s founders also saw themselves building a new Israel, and some early U.S. leaders hoped to see the Jewish state restored in its ancient land one day. A second reason is that Americans see our country as having a positive mission in the world. The Second World War, and the horrors of the Holocaust, convinced many — including some formerly skeptical American Jewish leaders — that Jews needed a state to survive. The Holocaust is not the reason Israel exists — the foundations of the state were already in place — but many Americans backed Israel as a form of restorative justice. Third, Israel has been America’s most dependable ally, to the point of putting its own citizens at risk for the sake of American security. In the Gulf War, when Saddam Hussein rained Scud missiles down on Israel in retaliation for U.S.-led strikes on Iraq, the Israeli government obeyed the Bush administration’s request that it not strike back, so that the coalition — which included Arab states, but not Israel — could remain intact. No other country does that. Fourth, the Israeli and American people have a genuine affinity for one another, one strengthened by political, cultural and economic ties. Israel, like the U.S., is a vibrant democracy. Israel also has a cutting-edge high-tech sector, and Israeli firms are ubiquitous in Silicon Valley. Israeli television shows have inspired hits like Homeland, and now stream on Netflix. Military ties have strengthened these bonds: Israeli innovations in missile defense, partly funded by the U.S., are being adopted by American forces. Finally, the behavior of the Palestinians and their allies has driven Americans and Israelis closer together. Not only have Palestinian terrorists targeted Americans — such as Taylor Force, a U.S. army veteran killed in 2016 — but the Palestinian leaders back anti-American regimes, the latest being Nicolas Maduro’s socialist tyranny in Venezuela. And Americans will not easily forget the sight of Palestinians dancing in the streets after the 9/11 terror attacks. Do pro-Israel donors support American politicians? Absolutely — just as proponents of any other policy view do. But they do not control outcomes: President Barack Obama and the Democrats backed the Iran deal in 2015 over the objections of AIPAC and pro-Israel donors. There are also well-funded groups that oppose Israel, or Israeli policy. 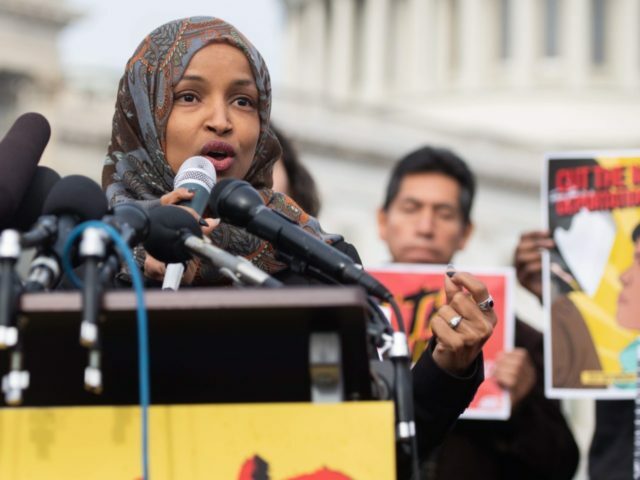 Omar is not opposed to those: before her offensive tirade Sunday, she re-tweeted a statement of support from the Muslim Public Affairs Council, backing her criticism of Israel. Jews are politically active on both sides of the aisle. Pointing that out is not wrong. Nor is it wrong to criticize their particular views or actions. But that criticism crosses a line when it resorts to irrational stereotypes. The toxic belief that wealthy Jews manipulate politicians to harm America is one Ilhan Omar shares with the mass murderer at the Tree of Life Synagogue in Pittsburgh. It is abhorrent.